A pocket guide that is practical and easy to use. Published in three languages(English, Spanish and Portuguese). It offers all the options business in the Latin American, American and Brazilian. Furthermore, it can be used as a notebook handy to take notes and phone numbers. Gois Broadcasting is a family owned business that has been helping our clients grow by reaching Latinos for over 30 years. 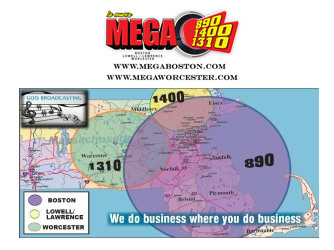 All of our Massachusetts stations are 24×7 and are branded as “La Mega” which is the largest brand in the Latino radio world. We also own and operate two Latino radio stations in Connecticut. We’re the largest Latino radio broadcaster in New England. Here’s a quick coverage map. Why telling a story is the most powerful way to put any message across and make it stick to our memory? When we tell stories it helps us shape our thinking and way of life, and we can have the same effect on our audience too. Using his experience in the teaching, consulting and publishing world as a starting point, James McSill demonstrates the importance of good storytelling in book writing, the business world and how to enrich your own life by changing the way you interpret your own story. Storytelling is not arbitrary. It is based upon rules, certain time-tested principles that apply to all types of stories. Just look at any hit TV shows, classic novels, great stage plays and/or blockbuster films. In all of these genres, the story that is being told may be vastly different, but the underlying principles behind that story are all the same. Master Printing & Signs opened it door in 2007, and since then we have grown and increased our range of services. Our team works hard to ensure quality products at affordable prices for you, we’re not happy until you’re happy.